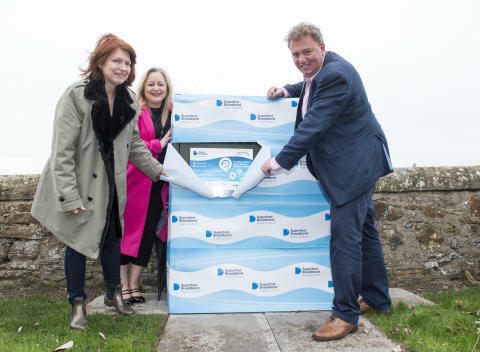 Graham Bucknall from The Ship Inn, Councillor Linda Holt and Samantha Lindsay-Dorward (Digital Scotland Community Project Officer) unveil the latest high-speed fibre broadband in Elie. Nearly 600 homes and businesses in Elie and Earlsferry are now able to connect to high-speed fibre broadband, thanks to the £428M Digital Scotland Superfast Broadband programme. The Digital Scotland team celebrated fibre availability in the East Neuk this week as they visited a fibre street cabinet that serves part of Elie. They were joined by Graham Bucknall from The Ship Inn – which has recently upgraded to fibre broadband – and Councillor Linda Holt. The latest premises are among around 800,000 homes and businesses across Scotland which are now able to access fibre broadband through the Digital Scotland rollout. Other areas in Fife to benefit from the rollout, led by the Scottish Government, now include Auchterderran, Crail, Kincardine, Newton of Falkland, Peat Inn, St Monans and St Andrews. More local coverage will follow as engineers from Openreach – Scotland’s digital network business - continue work on the ground. Local people can check the Digital Scotland website - http://www.scotlandsuperfast.com/where-when/ - to find out if they are able to access the latest fibre broadband technology. People need to sign up with an internet service provider, as upgrades are not automatic. Graham from The Ship Inn said: “It was a pleasure to join the Digital Scotland team to celebrate the availability of fibre broadband in Elie. It's good to see this project reaching more communities and giving an increasing number of homes and businesses the chance to connect to high-speed broadband. “High-speed broadband is becoming increasingly important in people’s lives. Whether it is for running a successful business such as ours, or providing world-class facilities to our many visitors from Scotland, the UK or around the world, high-speed broadband is increasingly being seen not as a ‘nice-to-have’ but as an essential. “This latest roll-out from Digital Scotland is a vital ingredient in enabling us to provide a world-class infrastructure to what is already, in Fife and Scotland, a world-class destination. Councillor Altany Craik, Convener, Economy, Tourism, Strategic Planning & Transportation Committee, added: “It is positive news that the Digital Scotland programme is now live across many towns in Fife. I’m also pleased that superfast broadband is moving into more rural areas, such as the East Neuk. Fibre broadband is making a difference, whether you work from home, run a small business or are a busy family all wanting online at the same time. “It also means that tourists will be able to see all that the town of Elie has to offer and keep in touch with friends and family while they’re visiting. Linda Holt, Councillor for East Neuk and Landward, added: "Until yesterday I was one of the thousands of people in North East Fife who felt she had no alternative but to labour under slow internet speeds. I did not realise that a fibre connection with ten times my current speed was available for the asking. But you have to ask - your internet provider will not upgrade you automatically. “So I urge everyone to check whether they can access fibre broadband by going to the Digital Scotland website, and if they can, phone their internet provider about getting the upgrade installed. Digital Scotland has made my children, my partner who works from home and me very happy!" Sara Budge, Programme Director for Digital Scotland Superfast Broadband, said: “It’s fantastic news that the programme has been able to benefit The Ship Inn so significantly in Elie.